Loudoun’s new board didn’t get much of a warm-up. The board—led by the first Democrat to be elected county chairman at-large—took the dais as the county dove into a difficult budget year, began developing a new comprehensive plan, witnessed the arrival of the Silver Line metro extension construction, and wrestled with a long list of development and road projects. While the board has a majority of first-time supervisors, the county also has a lot of relatively fresh faces on staff in key positions—among them, county attorney Leo Rogers, planning and zoning director Ricky Barker, and director of management and budget Erin McClellan, who took over after the retirement of longtime chief financial officer Ben Mays. Mays created the county’s pioneering fiscal impact models and guided the county through years of explosive growth. Board Vice Chairman Ralph M. Buona (R-Ashburn) credited Mays with the county’s flawless credit rating. 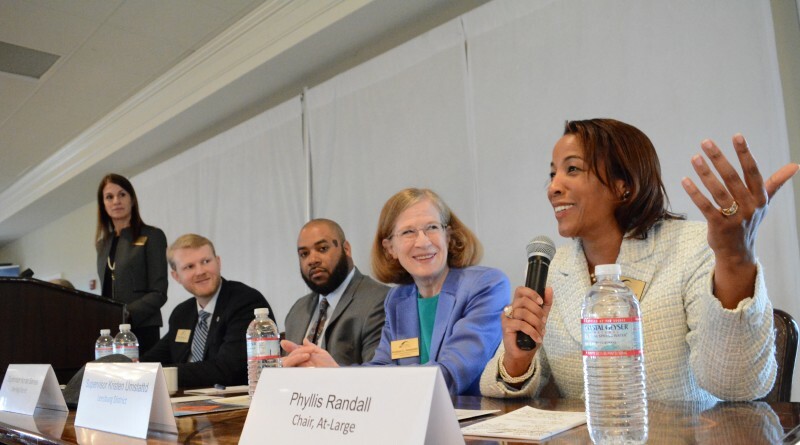 Those staff members have been crucial in getting the new board up and running, and they play important roles as the county continues its headlong growth into the DC metropolitan area and grapples with how to protect its rural west. It does this work under the direction of County Administrator Tim Hemstreet, who has now worked for three boards—one majority Democrat, one all Republican, and the current, majority Republican board. The county also has had to negotiate some tricky challenges, from Dominion Virginia Power’s plan to run power lines down Rt. 50 to AT&T’s plans to build a massive building atop Short Hill, to a new Virginia law restricting the use of proffers that threatened to cripple the county’s ability to manage growth. One of the county’s proposed alternate routes for Dominion Virginia Power’s new transmission lines, which the SCC will consider Tuesday. 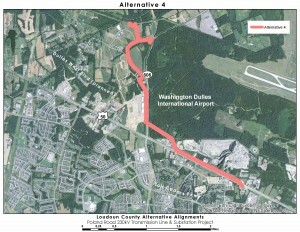 In the case of Dominion’s planned powerlines, the county without fanfare acquired land along the planned route, at the intersection of Rt. 606 and Rt. 50. The county has long planned to build an interchange at that intersection, but the land acquisition helped give supervisors an upper hand in its powerline battle. Dominion can condemn privately-owned land, but not publicly-owned, meaning it would need to get easements from the county. “Given that the interchanges are not designed, I anticipate that the Board of Supervisors will require as a condition of conveyance that Dominion agree to relocate, at its cost, any overhead power lines which are inconsistent with the final design of the interchange,” wrote Planning and Zoning Director Barker in response to a Dominion inquiry. The power utility backed off, and ultimately the State Corporation Commission approved one of the alternate routes endorsed by the county board. 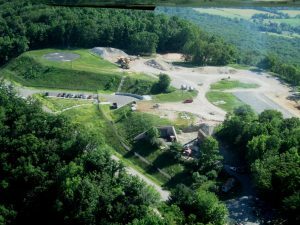 Around that same time, the county staff and supervisors were grappling with a permit granted by the Planning Commission which would allow AT&T to build a massive facility atop its underground facility on Short Hill Mountain. The board had only 60 days from the commission’s vote to act, or the permit would stand. AT&T maintained throughout that its facility would improve service to Loudoun County, but the county’s own Communications Commission remained skeptical of AT&T’s secretive plans for the building. Facing an up swell of organized opposition, especially from people living nearby in Lovettsville, AT&T requested to withdraw its application only days before the Board of Supervisors was scheduled to vote. Even with the threat of an aboveground facility gone, many of the connections that were made in the communities around Lovettsville remain. But the biggest single blow to the county could have been a law passed in the General Assembly that strictly limits the proffers localities can solicit or accept from developers, and imposes a heavy burden on localities to defend their decisions on proffers if challenged by a developer. Proffers, in which developers agree to make contributions such as building roads, setting aside a certain number of below-market-cost affordable units, or cash payments into different county funds, are an essential part of how the county has worked to keep up with its own growth, especially as state agencies like the Virginia Department of Transportation are unable to keep up. Loudoun’s attorneys determined that the proffers law, originally written by the Homebuilders Association of Virginia, would cripple the county’s ability to negotiate with developers. 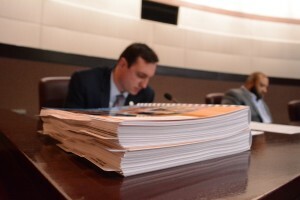 But Loudoun legislators worked to get exemptions written into the bill, including one for small area plans around current or future Metro stops. Taking advantage of that exemption, the county has created small area plans around each of its three future Metro stops, sized to encompass the county’s suburban policy area in the east. This, county staff members expect, will allow the county to continue with business as usual in the part of the county where it matters most. The new board’s harmony has not been without hiccups. Supervisors were divided along party lines when resolutions were introduced to recognize National Gun Violence Awareness Day—a conversation which Republican supervisors Ralph M. Buona (R-Ashburn) and Suzanne M. Volpe (R-Algonkian) cut short by tabling the motion indefinitely, which the board’s six Republicans agreed to over its three Democrats—and LGBT Pride Month. 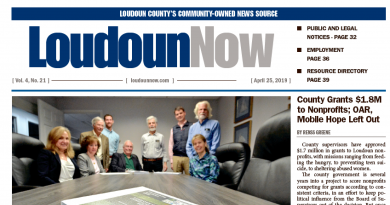 Love Loudoun Month passed narrowly, with five supervisors—Buona, Meyer, Tony R. Buffington Jr. (R-Blue Ridge), Matthew F. Letourneau (R-Dulles), and Koran T. Saines (D-Sterling) voting aye; and Randall, Volpe, Kristen C. Umstattd (D-Leesburg), and Geary M. Higgins (R-Catoctin) opposed. In the wake of the LGBT Pride Month and Gun Violence Awareness Day controversies, the board also changed its rules of order, requiring both the chairwoman, Randall, and vice chairman Buona to agree to put a resolution on the agenda, giving each effective veto power over ceremonial resolutions. Only Umstattd opposed that rules change. However, on other votes, the board has seldom voted along party lines. Randall and Buona often say they’ve stolen the words from the other’s mouth, and Randall’s catchphrase “I’d like to associate myself with those comments” has become a recurring joke among board members when they wish to echo another board member’s sentiments. But the new board has only begun its four-year term, and finance committee Chairman Supervisor Matthew F. Letourneau (R-Dulles) said next year’s budget may bring the first real challenges to board members. In the second year, he said, new supervisors find their stride and start advocating more aggressively for their causes. “The second year is when board members have started to be in office a little while, they’ve got their own priorities and their own capital projects in mind,” he said. “So that’s going to be a good test.” Letourneau’s finance committee has already begun work on next year’s budget. This board is also still grappling with plans for the Silver Line and an overhaul of its comprehensive plan. Both are massive undertakings, and both will guide the county for decades of expected growth in the east. The comprehensive plan overhaul, which began this year, is expected to take 18 months, and involves a 26-member stakeholder steering committee, a team of consulting firms, and a program of community outreach and listening sessions, as the county tries to decide what kind of county it wants to be. Meanwhile, supervisors continue to try to map out what will be best for development around its three future metro stations, which is expected to be intense. In January, the board will hold the second annual organizational meeting of its term, and changes are expected on the dais. Where those changes go—and where the county’s changes go—only time will tell.